I have been a U.S. Coast Guard licensed captain since 1985. A native of Cambridge, Massachusetts, I have also lived in Switzerland and Guadeloupe. I am fluent in German and speak a little Spanish and French. I have lived aboard boats since the mid 1970's, starting with a 21' boat, then a 42' schooner, and finally the 48' Storm Petrel which I have owned for over 25 years. A water lover in every way, I was a champion Master's swimmer, scuba diver, and windsurfer. A fan of photography, classical music, literature, and West Indian culture, males me an interesting and low-key companion. Phil grew up boats, starting with his Father's power boats and rowing shells as a child, then moving onto his own 21 foot sailboat in his early 20's. He lived aboard that boat in the Bahamas, Abacos and Florida, making numerous trips across the gulf stream in that little boat. Around 1980, Phil purchased a 42' steel schooner, where he learned more about the electronic, plumbing, wiring and all systems associated with a larger boat. After also delivering many boats as crew or captain, he learned what he wanted to have in his own boat. He was able to purchase the current Storm Petrel from her builder in 1990. He refitted her to his specifications over the years of ownership. 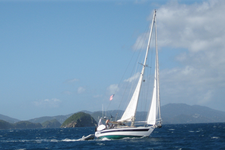 Laura learned to sail at age 25, and bought her own sailboat the following year. She has sailed the Illinois River aboard McGillicuddy, her Columbia 23. She met Phil and began sailing with him full time in 2002 aboard Storm Petrel. She has made 11 offshore deliveries southbound, and 7 northbound, 1500 miles each way from Cape Cod to the Virgin Islands. She has been a USCG licensed captain since 2009.